What does it cost to own a car? There are a few factors that add up to owning a car, besides the vehicle itself. In this post, we will talk about those apparently invisible costs so you can calculate the “total” ownership. In simple words, depreciation is the decrease in the value of a good, over a period of time. Consider that this is the wear and tear of the car over time. Usually, people forget to include the depreciation cost when buying a car. The cost can vary depending on time, condition and the demand of the car, in the market. It also depends on the success of your car’s model in the market. For a time period of 5 years, car depreciation cost can add up to 48% to the ownership expense of the car. Auto insurance is definitely an important aspect of the car ownership expense that should be taken under consideration when buying a car. The price you pay the insurance company depends on your car type, your driving history, your age, gender and location. According to the Highway Loss Data Insurance Institute, insurance fees make up almost 10% of total ownership costs over a 5 year period. When talking about the charges of a car, fuel costs usually appear near the top of the list. On average, for five years, fuel consumption cost can add up to over 20% of your car’s ownership cost. This expense depends on the fuel efficiency of your vehicle, as well as the prices of fuel in your area. The repair and maintenance of the car can further add up to an estimated 4% to the car ownership cost for the first 5 years. 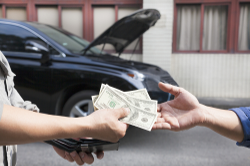 Car washes, oil changes, breakdown repairs, etc, are all included in the maintenance costs figure. When talking about ownership costs, how can we forget the taxes imposed by the state? As estimated, the taxes make up almost 5% or more of the car ownership cost. So before buying a car, don’t forget to consider all these expenses that come with your new car, apart from the purchase price.